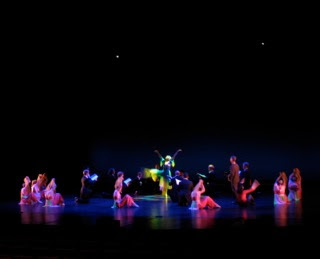 We're rehearsing now for our performance of Chen Yi's "Spring Dreams" with the China Dance ensemble. The song is about a poet who wakens and looks out at his precious garden to find that it has been destroyed in an overnight storm. We are the garden, the dancers are the storm, and the soloist, Crytal Lee, is the poet. It's at the Palace of Fine Arts tonight, 8.30pm - you could probably still get tickets to see us dance!